When searching for car financing, just as with any other loan, you want to determine the deal that’s best for you. In order to do that, you’ll need to compare offerings from a number of different lending sources. Comparison shopping ensures that you know what is available in the marketplace. Car dealerships will likely offer you a car/loan package deal. Though this may be the easiest and most convenient method of financing, it may be far from the best. Just as in negotiating the price of a car (which is an entire subject all to itself), don’t automatically accept the first deal that’s pushed at you. If a dealer is quick to give you something, it’s probably in their best interest, not yours. As with any other loan, the first thing that you’ll want to determine is your own credit condition and financial situation. Do you already have a lot of debt? How much of a down payment can you make? What’s your credit score? All of these things have a bearing on what you are able to afford, and the type of loan that you’ll be offered. When you have an idea of what you can qualify for, you’re in a much better position to discern a good deal from a bad one. After you’ve taken stock of your own position, compare lenders as well as the loan packages that they offer. Do a market analysis of the current interest rates. But keep in mind that rates can and do vary among different lending institutions, even if your credit is poor. Don’t neglect the bank or credit union that you currently do business with; they may be able to offer you very competitive rates in order to keep your business “in-house”. But, by all means, don’t stop there. 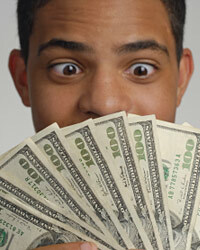 You can search a variety of lenders quickly and efficiently by using the Internet. When comparing loan programs, be aware of the “fine print”. If a package looks to good to be true, the likelihood is that it is too good to be true. Oftentimes lenders will give you a choice of a certain payment over a number of months, or a different payment over a different number of months. Be careful; payment and length of term are not the only things that are changing. Interest rates generally also change with the length of financing on car loans. Rates can change again with the amount of down payment that you pay. Are there any rebates being offered? If so, how do they affect price and interest rate? Does the vehicle’s price change if you finance with someone other than the dealer? Does the price change if you have a trade-in? Don’t just look at the monthly payment that you’re offered. You have to consider the cost of the loan as a whole. And don’t rule out getting pre-approved; it can make the whole car-buying process much simpler. Don’t allow yourself to be pressured; there are still plenty of “used-car dealers” around. The truth is, finding a good car loan is no different than finding any other type of loan. Shop around; compare programs and numbers. Doing your homework and comparison shopping will help you to select the best car loan for your financial situation.